Big Brosky Bidallz headed down to Kaza Maza for Imaging Apartheid, an intimate Jazz benefit concert to build support and raise funds for the ‘Imaging Apartheid’ Poster Project for none other than Palestine. As Mickey Boston is part of Tadamon!, it was only natural for him to be there. Despite not performing his anti-colonial banter in a hip-hop set, Brosky headed down alongside CUTV to capture the event as both journalist and photographer. In essence, it is as the global movement in solidarity with the Palestinian struggle for liberation continues to grow that Imaging Apartheid is calling on graphic designers and artists to submit work for a universal poster art exhibition. In the next months, Imaging Apartheid will be holding a series of concerts to raise funds and reach out to artists in the Montreal area. As far as the show itself went, it was undeniably a full-house. 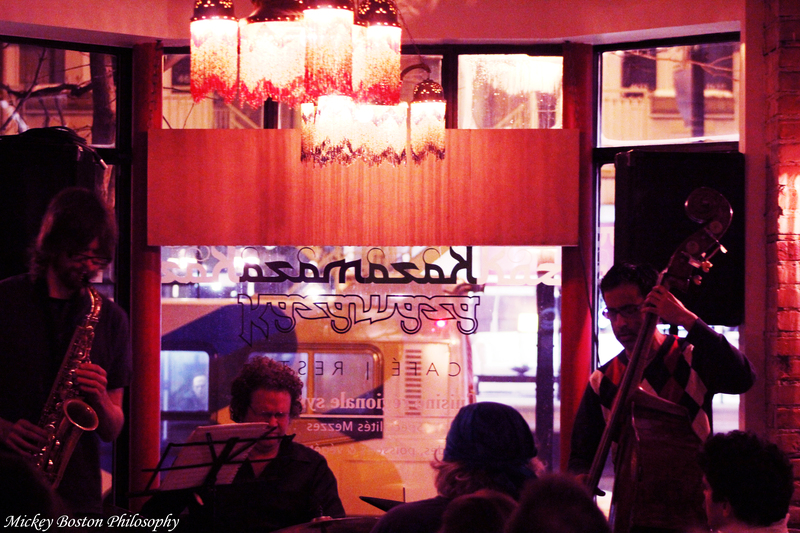 As the ambiance of Kaza Maza was fitting for a jazz concert, the concept of having jazz on a rather frigid Montreal night was undoubtedly cozy. Jason Sharp plays to a full house in Kaza Maza. 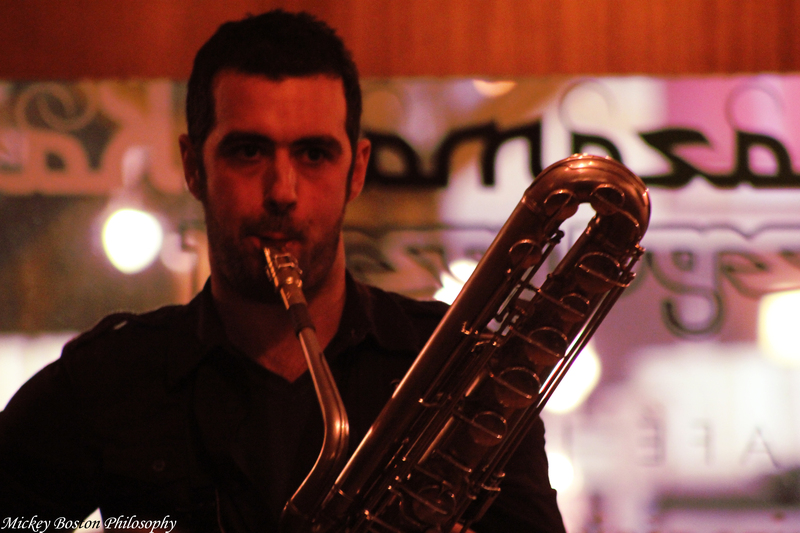 First up, to open the evening, was solo bass saxophonist, Jason Sharp. 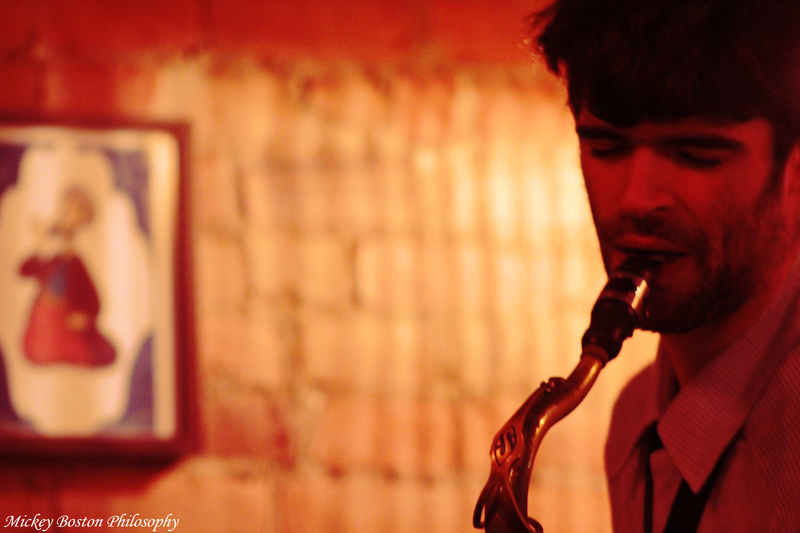 Jason Sharp is a baritone/bass saxophonist originally from Edmonton, Alberta. 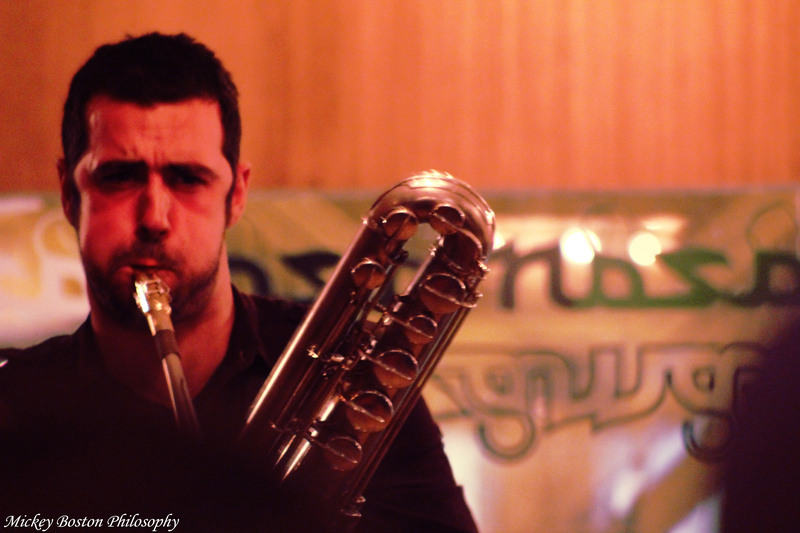 He has studied jazz improvisation at the University of Toronto, Conservatorium van Amsterdam, and understudied with the Jazz Composers Collective in New York City. Since moving to Montreal he can be heard in Josh Zubot’s Mendham Trio, Sam Shalabi’s Land of Kush, Nicolas Caloia’s Ratchet Orchestra, Joe Grass’s Tiny Dictators as well as on recordings with Matana Roberts and Silver Mt. Zion for the Constellation label. 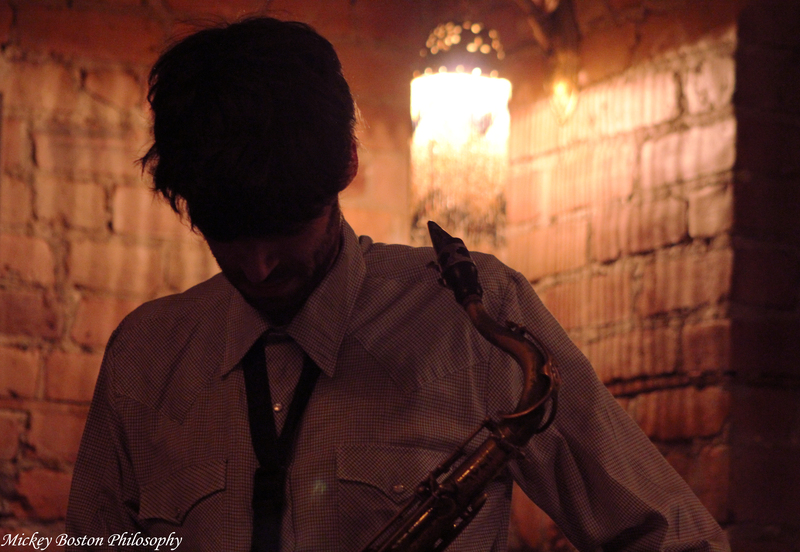 Jason’s set was then followed by a solo saxophone set by Adam Kinner and his fellow saxophonist. 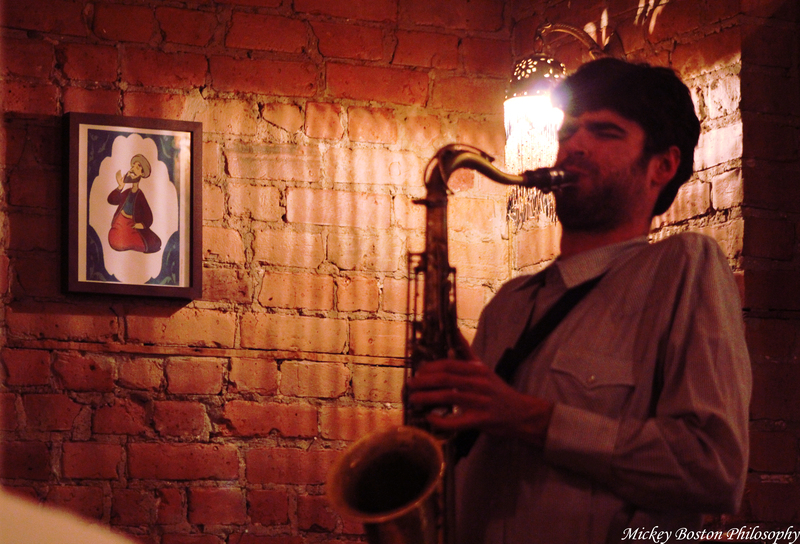 Adam Kinner is a saxophonist and composer who has been living in Montreal since 2002. He has performed throughout the U.S, Canada, and Europe with jazz, rock and contemporary music groups. In addition to appearing on more than twenty recordings, he’s a regular fixture on the music scenes in Montreal and New York. Finally, the evening closed off with a short performance by the Erik Hove Trio which consisted of Erik Hove on sax, Adrian Vedady on bass and Thom Gossage on drums. 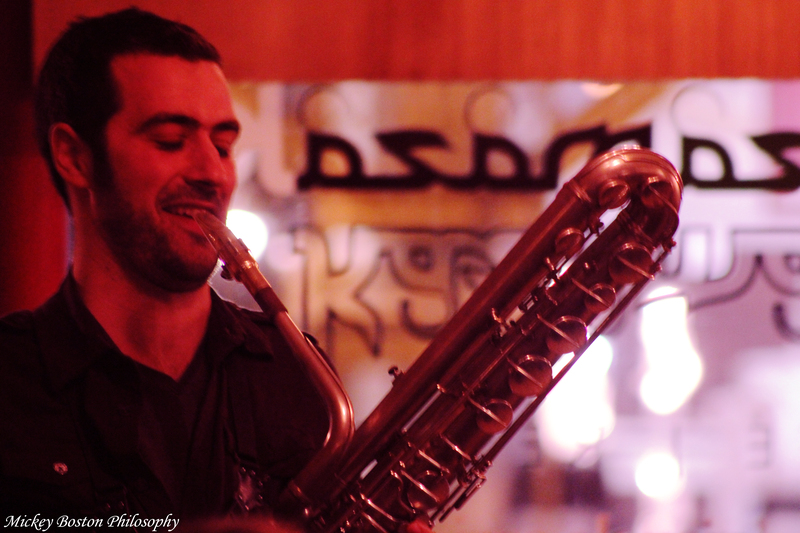 Erik Hove is an alto saxophonist known for his energetic playing with many of Montreal’s most exciting musicians, as well as with his own award-winning group Soundclash. 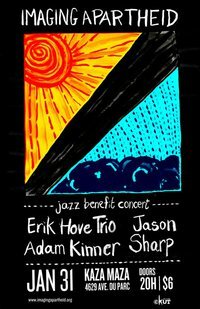 His trio offers an open-ended setting, with the goal of playing music with an inventive sense of melodic, rhythmic, and structural daring. The band embodies a healthy spirit of experimentation, playing with freedom and unfettered interaction. Posted in: Adam Kinner, Apartheid, ART, Erik Hove, Graphic dessign, Imaging Apartheid, Jason Sharp, jazz, kaza maza, Montreal, poster, Tadamon!